Over the past year, I’ve seen more and more photo collages pop up on my social media timelines. Some folks use iOS apps such as Frontback for an automatic front camera/back camera collage, while others manually put multiple pictures together with an iOS program such as Diptic. But you’re not limited to the iPhone or iPad to build collages—nor do you have to spend bank-breaking money on an image editor. For just $1, you can pick up PicFrame (Mac App Store link), a standout app for making quick and easy—and easily shareable—image collages. The app takes after its iOS sibling in design, offering 73 frame templates with up to nine photos in a template. Each template is adjustable in both positioning and size. You can’t build your own frame from scratch, but there are enough options here that it’s pretty easy to customize anything you might want. For example, you can make photo borders thin or thick, rounded or square, solid or patterned—whatever works for you. The overall dimensions of the collage can be altered, too, depending on what social network you plan to share with: You choose from 1:1, 3:2, 2:3, 4:3, 3:4, or 16:9. Some of the background patterns may be silly, but you can opt for solid colors, instead. To add a photo, you either drag and drop it into a frame, or click a frame and then pick an image from a standard OS X file-navigation dialog box. One added, you can zoom and move the photo to properly center the desired part in the frame. Images persist even if you switch templates, making it easy to play around with your design while building your collage. The 36 border patterns range from a classy textured paper to outrageously silly 3D plaid; you can opt instead for a solid-color frame if you’d rather eschew the extra personality. Beyond the borders themselves, however, there aren’t many bells and whistles—but that’s for the best when it comes to keeping PicFrame easy to use. If you want filters, captions, or extra frou frou, you’ll want to find a supplemental app (or use a more-complicated collage app to begin with). PicFrame lets you share your collage directly from within the app. You can export your collage at resolutions up to 3264 by 3264 pixels, depending on the quality you need, and directly share it—via Messages, AirDrop, Twitter, Facebook, or Flickr—using the built-in OS X Share sheet. PicFrame may not have the bells and whistles of fancier collaging apps, but its tools are perfect for those looking to put together a quick collage for an email message, Facebook post, or tweet. Want to find out about more cool Mac apps? Check out our Mac Gems session at Macworld/iWorld in San Francisco March 27-29. Want to stay up to date with the latest Gems? You can follow Mac Gems on Twitter or on App.net. You can also subscribe to the Mac Gems RSS feed. 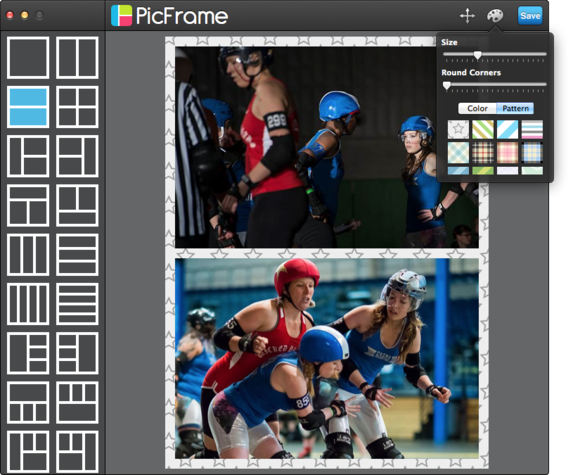 PicFrame for Mac may not have the bells and whistles of fancier photo-collage apps, but its tools are perfect if you just want a quick collection for an email message, Facebook post, or tweet.